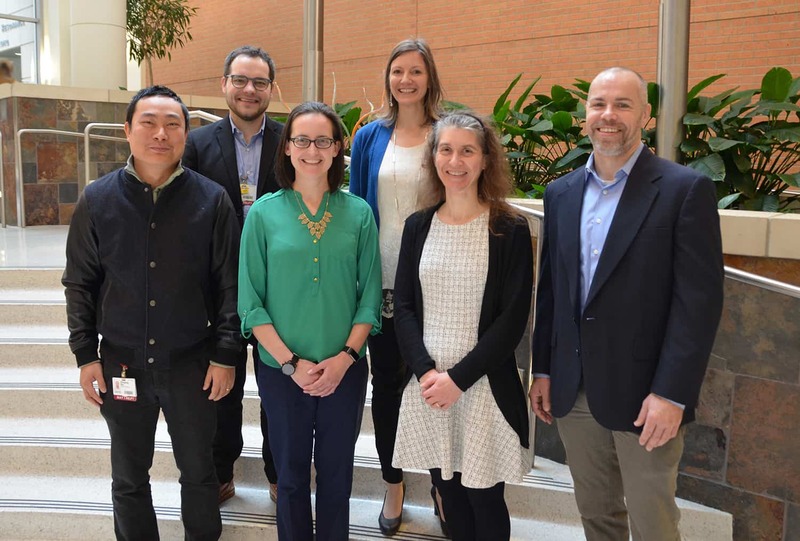 The 2019 Seeds of Science grant recipients from the UAMS Winthrop P. Rockefeller Cancer Institute are (left to right) Zhiqiang Qin, M.D., Ph.D.; Brendan Frett, Ph.D.; Stephanie Byrum, Ph.D.; Samantha Kendrick, Ph.D.; Alicia Byrd, Ph.D.; and Robert Eoff, Ph.D.
Feb. 5, 2019 | Researchers at the UAMS Winthrop P. Rockefeller Cancer Institute received a funding boost thanks to the efforts of two volunteer groups. 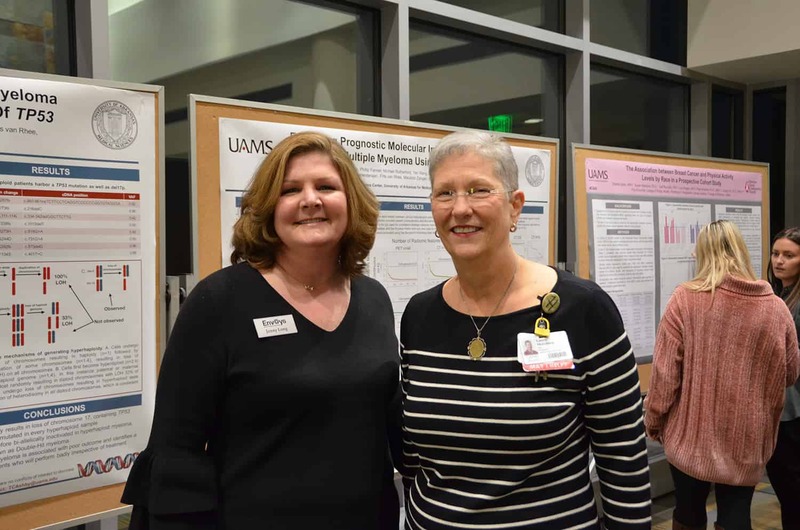 One small grant award of $50,000 and three pilot awards of $15,000 each were presented to UAMS cancer researchers at a reception and research poster showcase hosted by the Envoys volunteer advocacy group Jan. 31. Volunteers from the Hot Springs Village Walk for Cancer Research present funds for the Seeds of Science small grant award to Samantha Kendrick, Ph.D. (second from right). Also pictured (from left) are Cancer Institute Interim Director Laura Hutchins, M.D. ; Christy Etheridge; Donna Aylward; Bob Hebert; Lynne Border; and Melanie Pederson. Kendrick’s co-investigator Brendan Frett, Ph.D., is not pictured. The small grant award was funded by proceeds from the 17th annual Village Walk for Cancer Research, held Sept. 29, 2018 in Hot Springs Village. Organized by volunteers, the walk unites the community, which is located one hour southwest of Little Rock, in support of cancer research. “Knowing the money we raise is used to advance cancer research right here in Arkansas is very satisfying for those of us who organize the walk and participate in it,” said Melanie Pederson, event chair. Donna Aylward serves as co-chair. Since 2002, the Village Walk for Cancer Research has raised about $500,000 for research programs at the UAMS Cancer Institute. The 2019 walk is scheduled for Sept. 28 at Balboa Pavilion in Hot Springs Village. A team of two researchers received the small grant award for their work addressing drug resistance to aggressive lymphoma. Brendan Frett, Ph.D., assistant professor in the Department of Pharmaceutical Sciences in the UAMS College of Pharmacy, and Samantha Kendrick, Ph.D., assistant professor of Department of Biochemistry and Molecular Biology in the UAMS College of Medicine, are collaborators on the project. They are exploring using a proteolysis targeting chimera molecule along with targeted therapies to break down the cancer-promoting protein Nek2 found in aggressive lymphoma. This dual treatment approach has the potential to reduce drug resistance and lead to better patient outcomes. Jenny Long, president of the UAMS Cancer Institute Foundation Envoys, and Laura Hutchins, M.D., Cancer Institute interim director, were on hand to congratulate the Seeds of Science award recipients. Three $15,000 pilot awards were presented to researchers for their work in a variety of areas. Funding for the awards was made possible by RockStar Lounge, an annual fundraising event hosted by the Envoys. This year’s RockStar Lounge is set for April 5 at Cajun’s Wharf in Little Rock and will feature a performance by Memphis-based band Doctor Zarr’s Amazing Funk Monster. 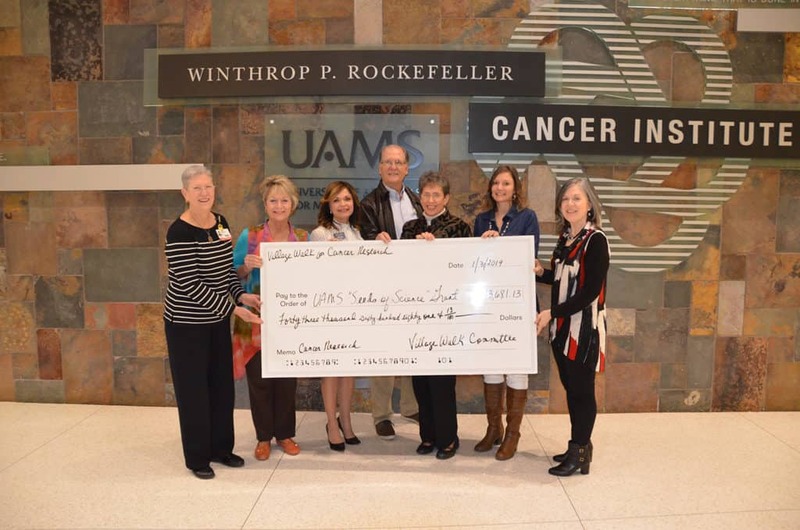 One-hundred percent of the net proceeds from RockStar Lounge is used to fund cancer research projects at UAMS. “We are always excited and pleased to present grants to our very worthy scientists for their innovative projects,” said Jenny Long, Envoys president. Byrd and Byrum’s project aims to identify new targets for cancer therapy by investigating the regulation of the DNA damage response pathway in cancerous and normal cells. Eoff’s project attempts to determine if a regulatory pathway normally associated with immune suppression in brain tumors also plays a role in resistance to the anti-cancer drug Temodar. Results of this study could increase understanding of how the elements involved in treatment resistance are regulated in malignant brain tumors. The subtype of lung cancer known as non-small cell lung cancer (NSCLC) is a leading cause of cancer death in Arkansas. Qin’s project examines the use of the gene EIF4G1 as a therapeutic target for NSCLC and could provide the framework for the development of a clinical trial evaluating EIF4G1-targeted therapy.